Agriculture is one of, if not the most promising application of commercial drones in the immediate future. From pest management to water dispersal, data collected by drones is becoming an invaluable asset for farmers. Singularly well positioned in this space is PrecisionHawk, the North American-based developer that uses a drone as part of their aerial agricultural artificial intelligence system. Lots of experts are comparing the advent of the commercial drone industry to the rise of the internet or even the rise of the PC. What the Precision Hawk team realized is, successful companies that got in on the ground floor when these revolutionary technologies were taking off built not just a product for consumption, but an entire platform that collects data and puts it to work. For example, a farmer says “fly,” the drone goes up, uses its ‘senses’ to collect data and spits out meaningful information about thousands of different hybrids of seeds spread over 20 acres of land. It truly is basic artificial intelligence. But Precision Hawk understands just because you have a lot of data, doesn’t mean you have a lot of information; converting that data into actionable information is just as important. That is why the 25-person team developed their own software platform, Precision Mapper. An example of a Lancaster "mosaic"
The tech is cool but there is a lot of red tape surrounding the (il)legality of commercial drone use in the U.S. So how does Precision Hawk get around it? “When we are approached by U.S. companies we follow one of two courses of action. We either make connections to pair businesses with universities in order to fly with a COA [certificate of authorization], or we begin projects overseas,” said Reich. In the meantime, their goal is expansion. 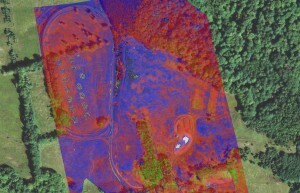 “We have been approached in regards to hundreds of potential remote sensing applications, ranging from chimpanzee habitat mapping in Gombe to crowdsourced tornado response in Alabama,” said PrecisionHawk’s new VP for Geospatial Applications, Jason San Souci. But the most important part of growing their platform is tied directly to the inherent functionality drones provide. Not only is this true for Precision Hawk, but it characterizes the commercial drone industry as a whole. The point of using drones is to automate simple tasks. The companies that develop these automated processes are going to be leading the pack when commercial UAS explodes into the mass market. If you have any questions or you simply want to learn more about Precision Hawk, San Souci is doing a Twitter Q&A on Thursday at 8 pm EST. You can follow him on Twitter @HawkGIS.